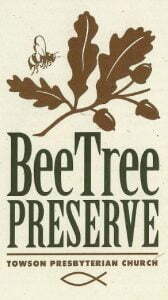 BeeTree Preserve is 263 beautiful acres of forests, fields, streams and wetlands located 25 miles north of Towson in Parkland, MD. Named for Beetree Run, a trout stream that meanders through the property, BeeTree Preserve's natural beauty and resources have welcomed visitors and inhabitants—both animal and human—for hundreds of years. Come and enjoy it for yourself! BeeTree Preserve not only offers miles of scenic trails for your use but other facilities as well. Two open air pavilions (one with a fireplace), men's and women's restrooms, a large play field, and Adirondack shelters for camping are available for church, scout, school, business or family gatherings. Additional facilities are planned to make your visit to BeeTree Preserve as comfortable and delightful as possible. The BeeTree Preserve borders the Torrey C. Brown Trail (formerly the NCR Trail) and contains two covered pavilions, bathroom facilities, and a cemetery/meditation area. The BeeTree Preserve also includes the BeeTree Cemetery, offering a serene, natural setting reserved for members of Towson Presbyterian Church and their families. A scenic hiking trail links the cemetery to the rest of the Preserve. Camp BeeTree is an intergenerational, week-long camp for children who have completed Kindergarten through Grade 5. 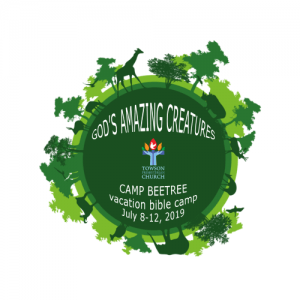 The camp is held the second week of July at the Church and the BeeTree Preserve, a 263 acre hiking, picnic, and open space facility in Parkton, MD. Children, youth, and adults join together for a VBS-type experience from 8:30 a.m. – 3:15 p.m. each day. The BeeTree Preserve borders the Torrey C. Brown Trail (formerly the NCR Trail) and contains two covered pavilions, bathroom facilities, and a cemetery/meditation area. A design team consisting of church staff and members plans a fun and inspiring program for children, who are assisted by 20 youth Counsellors In Training (Grades 6 and up), a much-loved tradition for youth is a voluntary fellowship/ work camp to ready Camp BeeTree. This optional program is offered as an all-day program on the Saturday before camp starts. Separate registration forms and information will be sent upon selection as a Counselor in Training (CIT).